Donald Trump and the race to be the Republican presidential nominee dominated political coverage in the first half of 2016, according to a study released Monday by Harvard’s Shorenstein Center on Media, Politics and Public Policy. Coverage of Trump largely drowned out the Democratic race and prevented a deeper conversation about the issues behind the race, the study concluded. “The Republican contest got 63 percent of the total coverage between Jan. 1 and June 7,” states the report, “compared with the Democrats’ 37 percent — a margin of more than 3 to 2.” The report was based on the Shorenstein Center’s examination of data from Media Tenor, an organization specializing in content analysis. Specifically, the study analyzed eight major news outlets for the entirety of 2015. 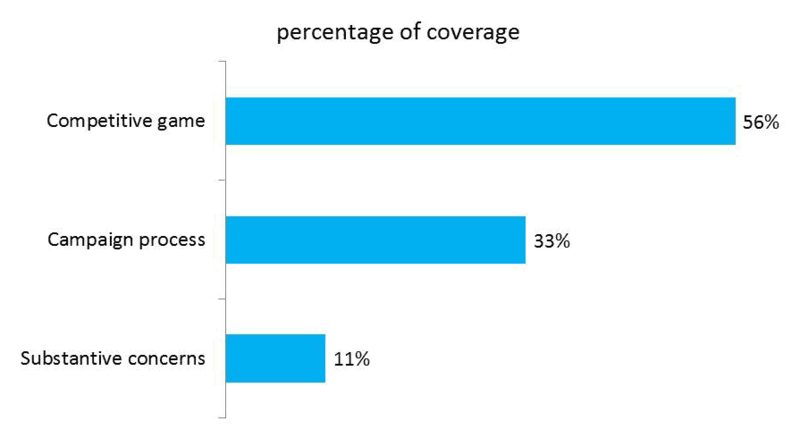 The tone of Trump coverage was neutral or positive 63 percent of the time in The New York Times (the lowest percentage studied) and 74 percent of the time in USA Today (the highest). 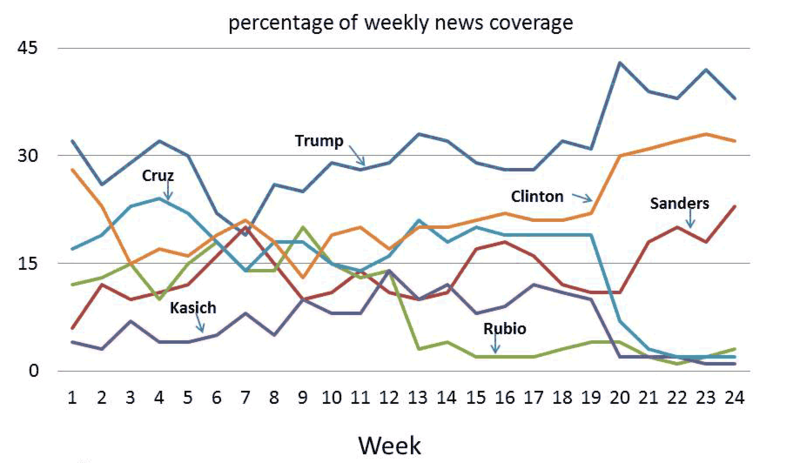 Trump also got almost twice as much media coverage as the next highest-ranking GOP contender: 34 percent of the total for Trump, to 18 percent for Jeb Bush. In the Democratic race, Bernie Sanders’ coverage was net-positive while Hillary Clinton’s was net-negative. The center’s study also argued that citizens get the least substantive information about the candidates’ positions on issues when they need it most: in the early stages of the primary season. And the horse race coverage may have produced unintended consequences. “Trump’s largest jumps in national polls during the primary period came in the aftermath of his victory in New Hampshire and his showing in the Super Tuesday period, which coincided with peaks in both the volume and positive tone of his coverage,” the report notes.